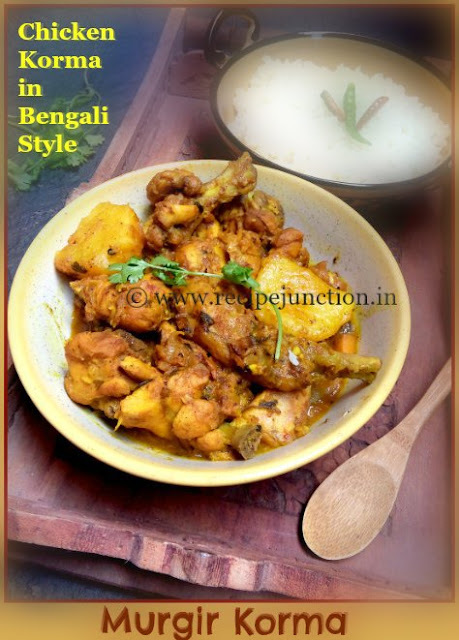 In Bengali cooking dictionary, "Korma" means any curry, cooked with mostly non-veg., meat or chicken or egg, in a mild yogurt based gravy with ghee instead of oil. 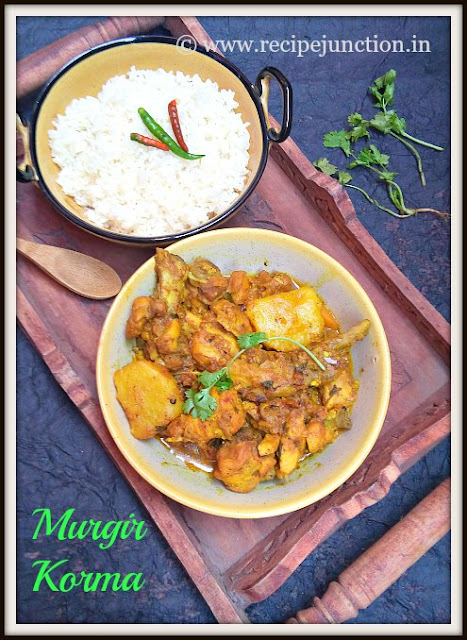 Korma has its urdu origin, influenced from Bangladeshi cuisine, is not so much exploited in Bengali cuisine. Though many non-veg dishes like Chicken or Mutton Korma, Dimer Korma(egg korma) are few which are beloved among bengalis. Originally, in korma recipe a large amount of nuts, poppy seeds are used along with yogurt to make a rich gravy. But this recipe I am sharing today, got from a recipe page(Senskitchen), is not so rich and spicy but extremely flavourful and delicious. 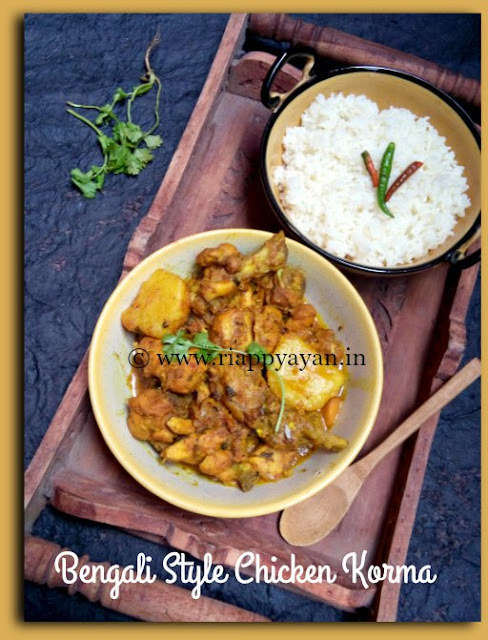 It is good for everyday cooking which really goes well with plain warm rice or even with pulao. Marinate the chicken pieces with ginger, garlic, coriander powder, turmeric and salt for 20 minutes. Cut potatoes in medium size chunks and marinate with salt for sometime. Heat oil in a pan. Fry the potato pieces in the oil and keep aside. Temper the oil with bay leaves, cardamom, cloves and cinnamon. Add the onions and sliced green chillies immediately after that and fry with constant stirring on medium-high heat till they are golden brown. Add marinated chicken and fry on medium heat for 4-5 minutes. Mix 2 tbsp water into yogurt and add to the chicken. Cook for couple of minutes on medium heat. Then add chilli powder, grated coconut and chopped coriander leaves. Mix well and cook for 2 minutes. Add fried potatoes. Add 1 cup warm water. Season with salt. Cover and simmer for 15-20 minutes or till potatoes and chicken are done. Adjust gravy consistency as desired. Serve hot with plain rice or pulao. Try this and let me know how you have liked it. I served it with hot plain rice and it was a heavenly, leisurely Sunday lunch.